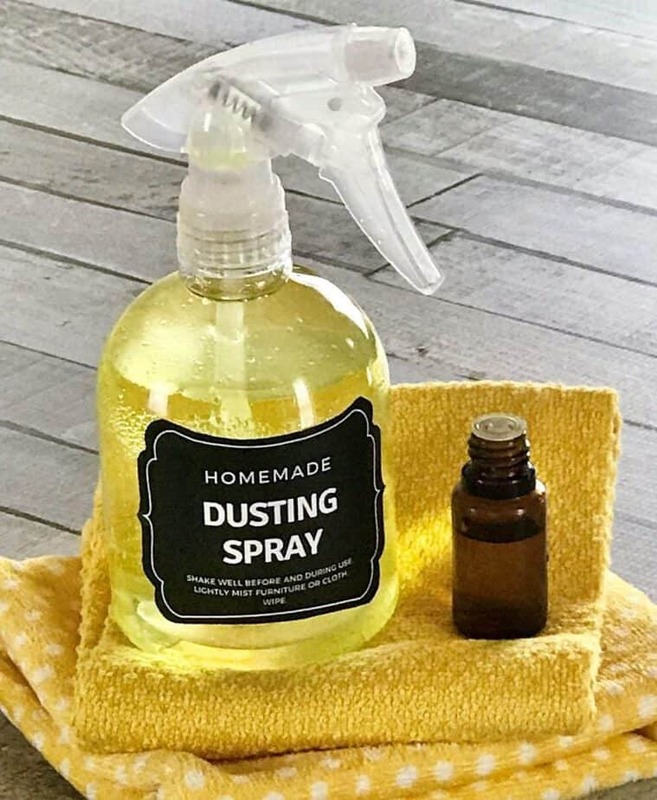 Years ago before I started using essential oils, I used to buy linen sprays. Some of them were high quality and made with essential oils and other organic ingredients. These were very expensive and I treasured them, using them sparingly when I wanted to treat myself or on special occasions. But unfortunately, many of the linen sprays I used to use were filled with chemicals, toxins, and artificial scents. less expensive– I can make my own DIY version for a fraction of the cost of the ones I used to buy. 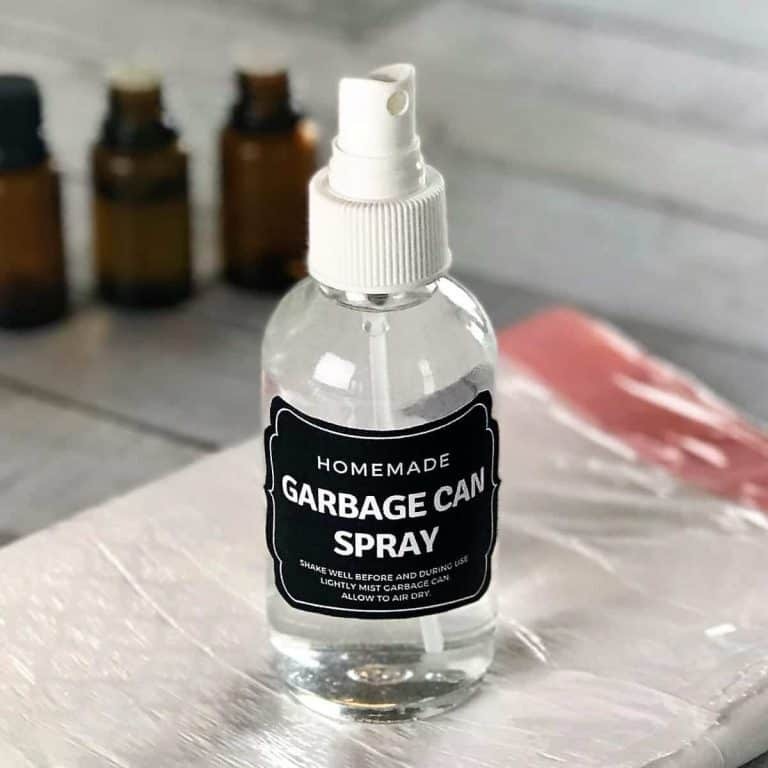 get exactly the scent (and therapeutic benefits) I want– Because I’m making the linen spray myself with my own essential oils, it’s easy to customize a blend to exactly the scent I want. If I want something sweet and spicy, I can make that. If I want something citrusy, I can make that. If I want something to help calm and relax, I can make that. Whatever I want, I can whip it up in about 30 seconds. No going to the store. No hunting for which aisle has the fabric sprays. No hoping they have something I like. Nope. Now, I’m in control. I get to make exactly what I want. 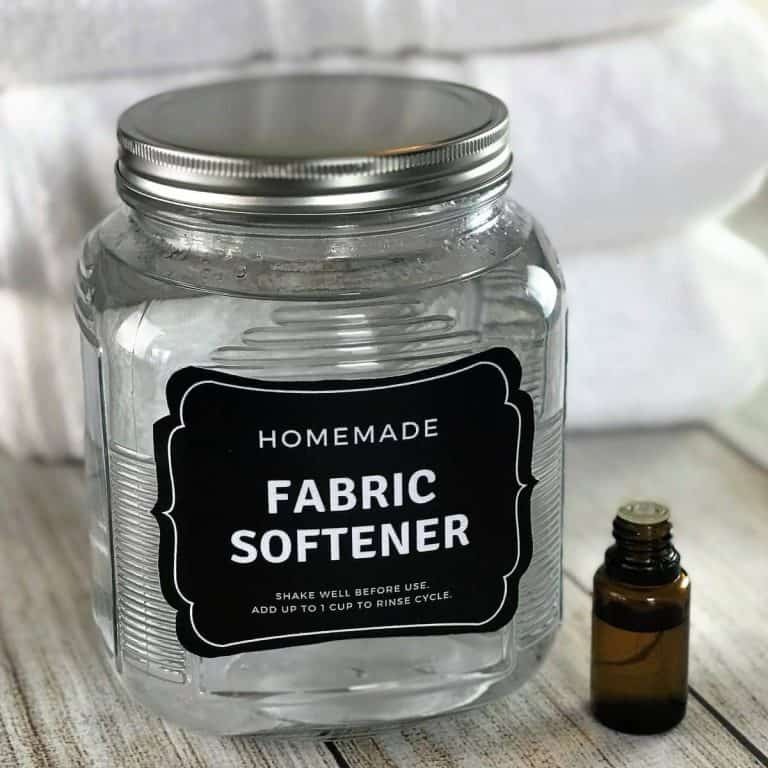 no chemicals, toxins, or artificial fragrances– The cheaper fabric refreshers that I used to buy at the grocery store and discount stores were convenient and inexpensive, but they were loaded with chemicals, toxins, and artificial fragrances. (oh, how I wish I hadn’t used those all those years! But we learn and we do better, right?) Now that I make my own, I control exactly what goes into it. And as you’ll see in the recipe below- that’s just two ingredients. No chemicals, nothing artificial. What exactly is a linen spray you ask? Well, it’s a way to scent fabrics. 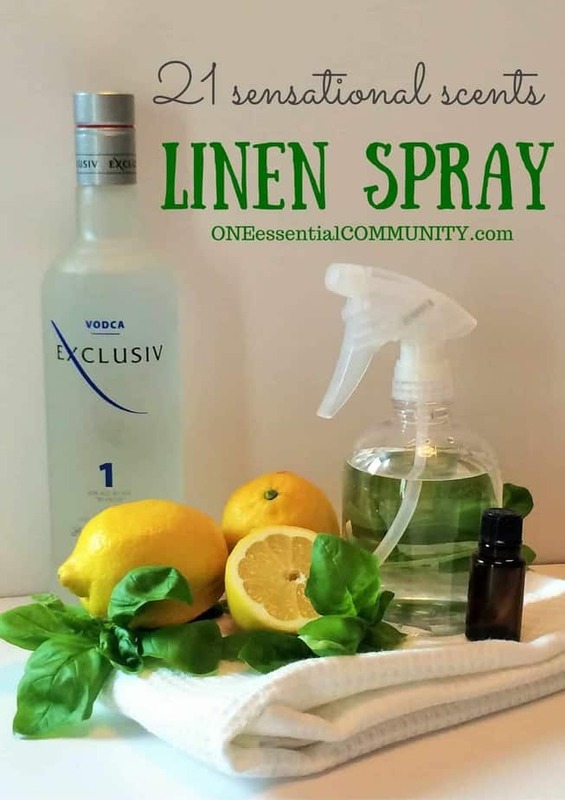 There are lots of reasons why you may want to do this and many ways to use linen sprays. Here are just a few. 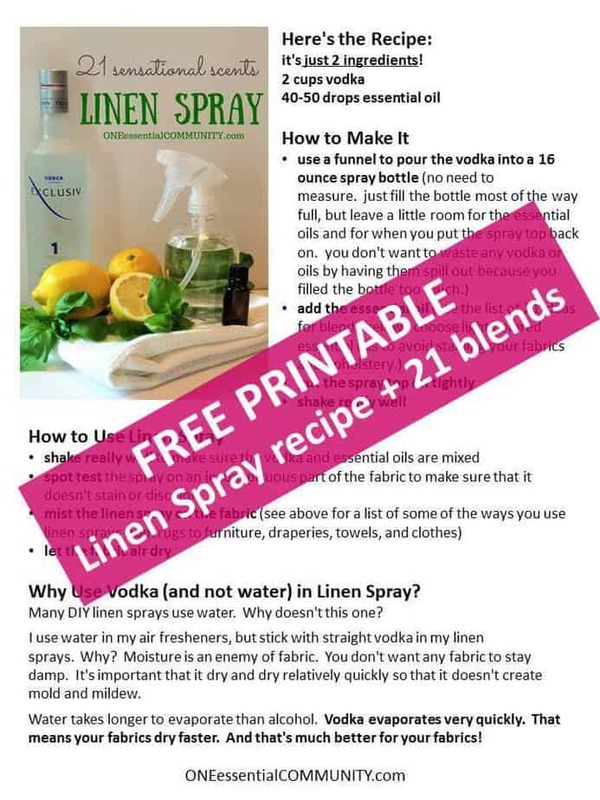 Why Use Vodka (and not water) in Linen Spray? 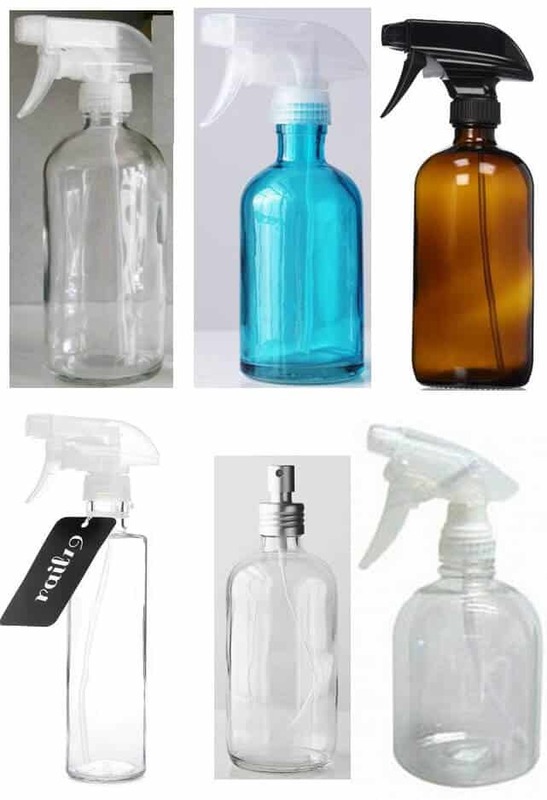 Many DIY linen sprays use water. Why doesn’t this one? 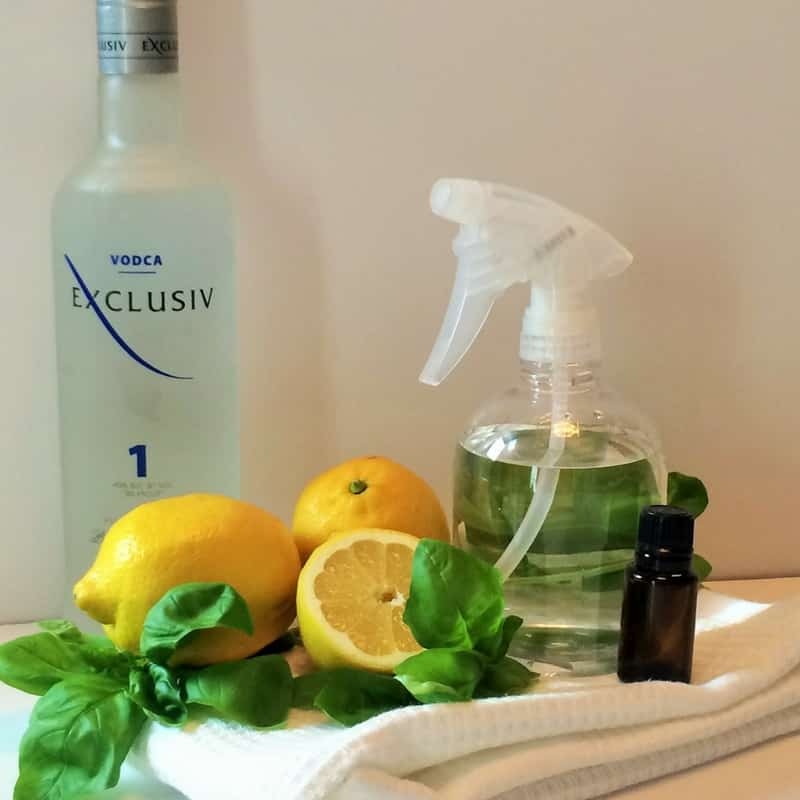 I use water in my air fresheners, but stick with straight vodka in my linen sprays. Why? Moisture is an enemy of fabric. You don’t want any fabric to stay damp. It’s important that it dry and dry relatively quickly so that it doesn’t create mold and mildew. Water takes longer to evaporate than alcohol. Vodka evaporates very quickly. That means your fabrics dry faster. And that’s much better for your fabrics! 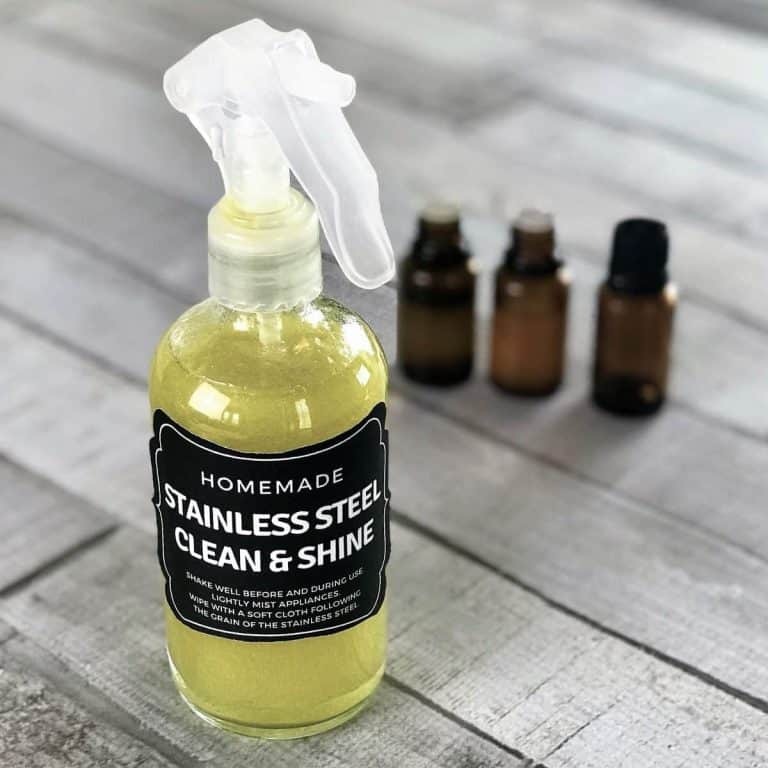 Materials: when using diluted essential oils like in this linen spray, choose bottles made of glass, plastic #1 (PET), or plastic #2 (HDPE). A few bottles I love! Citrus oils are fantastic at helping you to feel upbeat and invigorated. With so many citrus oils in this blend, it’s sure to put a smile on your face! shake well. spray fabric (be sure to spot test). allow to dry thoroughly before use. The fresh, slightly woody scent of cypress combines with the sweet smell of orange. The result is balanced feeling of being both grounded and uplifted. Makes for a very happy home! Everybody loves a citrus mojito!! The combination of lime, grapefruit, & tangerine, with a touch of spearmint is a way to relax and re-energize! Bergamot and orange ground this blend while ylang ylang adds a subtle but exotic floral note and the spearmint gives a fresh hit of mint. The result is a blend that supports emotional balance. Calming, uplifting, and energizing so that you feel good! The clean, fresh smell of the blend is a great way to start the day! It will clear the air and put a little pep in your step. I love the combination of the warm slightly spicy scent of basil with the light fresh scent of lemon! It relieves anxious feelings, promotes a sense of well being, and gives a boost of energy. 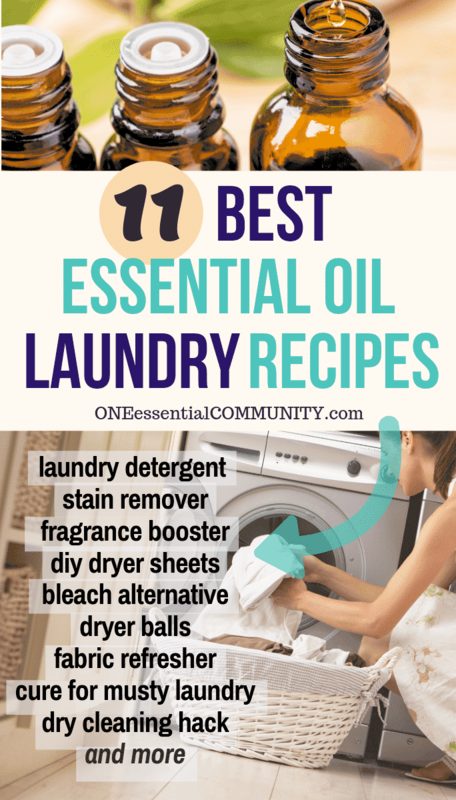 A great scent for all around the home, but I especially love this one in the kitchen and bathroom. 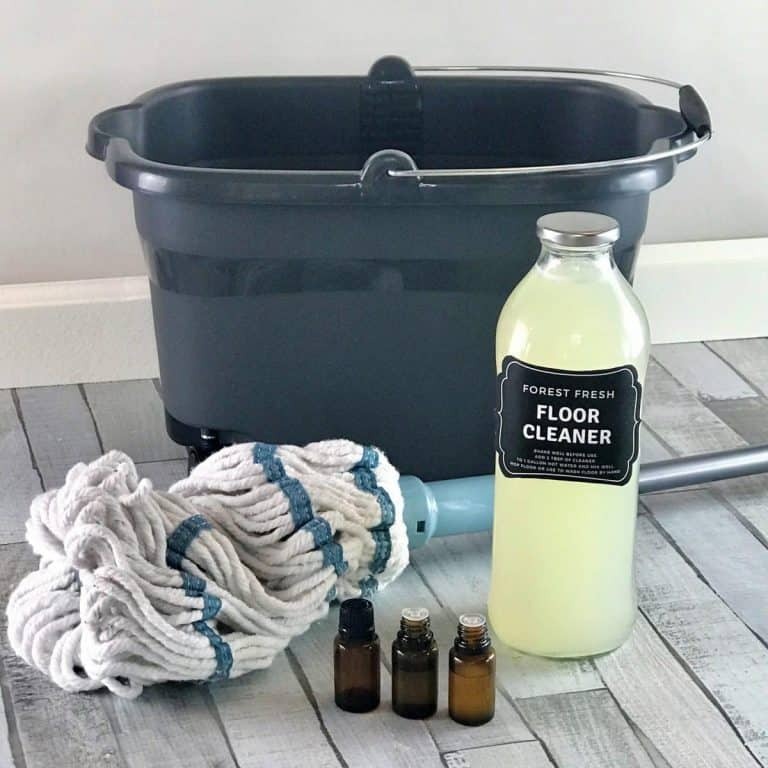 The slightly sweet, woody earthy scent of clary sage blends with the fresh herbal scent of rosemary and sweet citrus notes of orange, bergamot, and grapefruit. The result is a linen spray that energizes, uplifts, and helps focus the mind. A great way to wake up and start the day! Love this! The evergreen and minty scents remind me of a brisk walk outside when the weather starts to turn cold and Christmas is right around the corner. And just like the crisp, cool air on a clear sunny winter day this blend also helps support clear breathing. Fresh herbal scent with a touch of mint. Great scent that helps energize and invigorate! Relaxing blend that helps relieve anxious feelings and mental fatigue. Slightly sweet flowery and citrus blend that relaxes and uplifts. This feminine blend is a perfect scent for a fabric refresher that doubles as a subtle perfume. The perfect way to relax and recharge! Lavender eases feelings of tension and anxiety. Lime uplifts and refreshes as it balances emotions and well-being. And spearmint’s sweet, refreshing aroma is ideal to help clear the mind and evoke a positive mood. Oh, and did I mention it smells heavenly?! Fresh and floral! A fantastic combination to relax and re-energize to take on the rest of your day. Lavender calms, peppermint energizes, and sweet orange uplifts. When combined these essential oils can have an amazing effect on your mood. The warm woody aroma of cedarwood combined with the floral scent of lavender and the fresh sweet fragrance of tangerine evokes the feel of a walk in cool, crisp mountain air. Not only does this smell amazing, together lemon, lavender, and rosemary support open airways and clear breathing. Cool, crisp, and invigorating! You’re home has smelled so fresh!! Please note: This is for informational and entertainment purposes only and should not be taken as medical advice. Products mentioned in this article have not been evaluated by the FDA. These products and information on this page are not intended to diagnose, treat, cure, or prevent any disease. 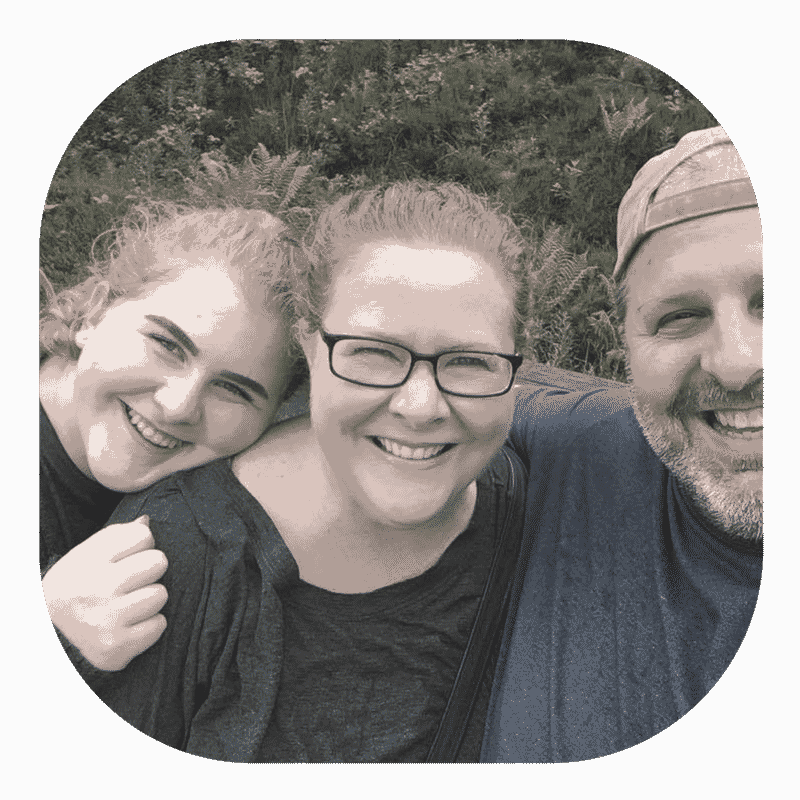 This website is not a substitute for professional care. Always consult your medical doctor regarding your medical care. Never disregard professional medical advice or delay in seeking it because of something you have read on this website.